40-year history of innovative, quality publishing. 1974 Good Ski Guide launched as the UK’s first commercial ski magazine by John Hill, with News International (Rupert Murdoch) money and staff. Instant success, thanks to News Int backing. At this time the UK ski market was very small, with market leader being Erna Lowe, carrying around 8,000 skiers, mainly to Austria. Good Ski’s mission statement was to grow the market and become Britain and Europe’s biggest and best ski guide. 1977 Good Ski Guide helps John Neilson launch Neilson Ski Holidays – inside 300,000 copies of GSG. Both Neilson and GSG became instant successes. 1980 Thomson, seeing the success of Neilson, called in Hill to help them launch its first ski product in an ever-expanding ski market. 1981 GSG helps Thomas Cook enter the ski market, and Cooks buy 250,000 copies of GSG for distribution and branches. 1983 Thomas Cook and GSG jointly launch Good Holiday Magazine as the UK’s first holiday title. Good Holiday Magazine still top holiday (rather than travel) title in UK. 1985 GSG teams up with the Daily Mail Ski Show and helps achieve a record audience of 120,000 – still a record and four times today’s audience. 1986 GSG becomes the best-selling sports magazine on the newsstands – outselling even football titles – ABC of 67,381. 1989 Good Ski launches Canada on the UK and European market. Lake Louise owner Charlie Locke signed a major deal with John Hill to promote Louise and attract British tour operators. Inside 3 years the number of UK visitors to Alberta grew from zero to 15,000 and is now 40,000. 1990 Neilson boss Warren Sandral buys 500,000 copies of Good Ski Guide to distribute to travel agents as a promotion for skiing, giving GSG an ABC of 464,000 copies – still a UK record for a sports magazine. 1991 GSG launches its own Visa card for readers, first on market and profitable from Year 1. 1993 GSG produces first Colorado Ski supplement – £85,000 revenue – still a record. – and ensured Colorado a major hit in UK. 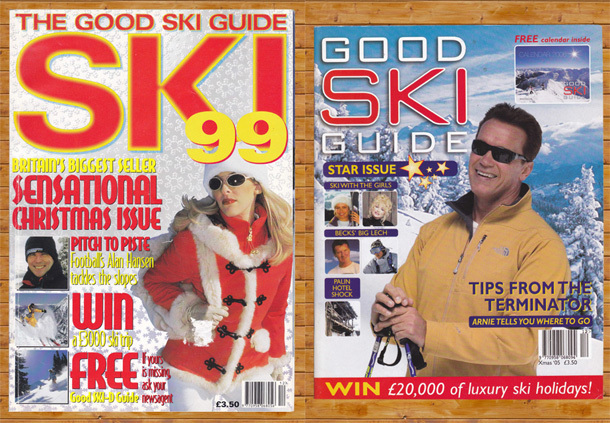 1995 www.goodskiguide.com launched as Britian’s first ski web site – and first sports magazine with a site. At that time the web was called the Information Highway.www.goodskiguide.com revamped 8 times since launch, and is being rebuilt again in 2014. 1995 GSG gets the UK motor industry involved in skiing in a major way- attracting ad and marketing campaigns from Audi, BMW, Nissan and Toyota. 1996 GSG sales top £500,000 for first time. 1997 GSG get a £100,000 for single issue deal from Nissan, still a record for a ski or sports title. 1998 GSG becomes first ski magazine to challenge a European law – after fronting the UK tour operators fight against the French Ski Schools’ ban on British qualified instructors – we won! 1999 GSG and Harrods launch the Harrods Ski Week, hugely successful, and would have continued but for the tragic death of Princess Diana. 2000 Good Ski needs funding to go international, so Barclays Bank, our bankers, encourage sale of GSG to Profile, an international media group. Profile were not the right match for us so Hill bought the title back with the aim of taking it international; he received funding from a group of ski industry investors in the UK, Austria and Canada. 2002 John Hill becomes the longest-serving editor of any British magazine. 2003 Good Ski Guide team launch Mountain Magic, the first ever magazine to promote ski and mountain resorts’ summer business. Mountain Magic is now firmly established in the market. 2006 Good Ski Guide launches on the international market – with major editions in the U.K., America and Canada coast to coast, in every major airport and city. In Europe the GSG will be published in English in every European capital- at airports and city kiosks – 15 million Europeans speak fluent English. 2009 German, Russian and Chinese language editions planned – by 2020 there will be 20 million skiers in China – double the number of skiers than the US! 2013 Good Ski Guide gets Hong Kong partners to launch GSG onto Chinese market. Mandarin and Cantonese editions planned. 2014 GSG sister magazine Good Holiday Guide launches digital edition. 2015 City of London banks take GSG in all HQs and head offices – giving worldwide distribution.